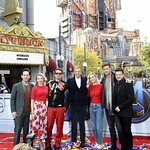 Academy Award-nominated actor Robert Downey Jr, one of today’s most prominent and influential actors, will receive the Make-A-Wish Greater Los Angeles Shining Star Award at the 4th Annual Wishing Well Winter Gala on December 7, 2016 at the Hollywood Palladium, it was announced today by Neal Aton, President and CEO of Make-A-Wish Greater Los Angeles. The Shining Star Award honors individuals who embody the organization’s mission to make a lasting impact on children and their families through the power of a wish. Said Aton: "We are thrilled to honor Robert Downey Jr. for his long-time dedication and generosity to Make-A-Wish. Robert has granted dozens of wishes for children around the world, and many more kids wish to meet him. Beyond the hope, strength and joy he personally brings to wish families, Robert has donated funds through his foundation “Random Act Funding” that allow many other children’s wishes to come true. In our eyes, and in the eyes of our kids, he is a real-life hero." One wish that Downey recently fulfilled was with nine-year-old Domenic, who has cystic fibrosis. Dominic’s one true wish was to be a superhero, and Downey Jr. worked with Make-A-Wish to make that dream come true. Downey also surprised seven-year-old Alex, who was born missing most of his right arm, by presenting Alex with a specially-made replica of Iron Man’s famous arm. Downey is best-known for his role as Iron Man in the Iron Man and Avengers franchises as well as his title role in the Sherlock Holmes franchise. In 1992, Downey received an Academy Award nomination, a Golden Globe nomination, and won the BAFTA (British Academy Award) for Best Actor for his performance in the title role of Chaplin. In 2009 he was nominated for an Academy Award, Golden Globe, BAFTA, and Screen Actors Guild (SAG) Award for his role as Kirk Lazarus in Tropic Thunder. The Make-A-Wish awards are presented at the annual Wishing Well Winter Gala, where entertainment executives, celebrities, top business executives, community and civic leaders, medical professionals and philanthropists celebrate the children and families whose lives have been changed forever by the power of a wish. During the past three years, these meaningful events have collectively raised almost $3 million for wish kids living in Greater Los Angeles. Past honorees include sports stars Kobe Bryant, Landon Donovan and Oscar de la Hoya; philanthropists Sam Nazarian and Michael Rosenfeld; and medical pioneers Children's Hospital Los Angeles, OneLegacy and Mattel Children’s Hospital UCLA. • To make a donation, visit www.la.wish.org.